Buy ANY BOOK and get another of Nancy's books FREE! You can choose A CHEERLEADER'S DREAM, THE PINK DOLPHIN, NIRA'S HEART or THE RED CAT for your free book. If you purchase directly from Nancy via PayPal or by check, send an email with the book of your choice. If you buy the book from Amazon or Barnes & Noble, include your e-receipt (within the email or as an image) as proof of purchase in your email to Nancy. Look inside A CHEERLEADER'S DREAM. ​Christa was small for her age but she was a smart girl. With the help of a special friend Christa learns the importance of standing up for yourself and being content with who you are despite the world around you. 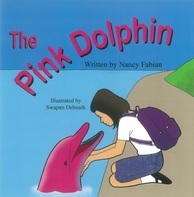 Read more about THE PINK DOLPHIN. Nira was a princess. She was kind and warm-hearted. But Nira was not a beautiful princess like most princesses are. Read more about NIRA'S HEART. Mindy was a loving cat. She loved to play and run, like most cats do. But Mindy was a little different from other cats. Read more about THE RED CAT (EL GATO ROJO).